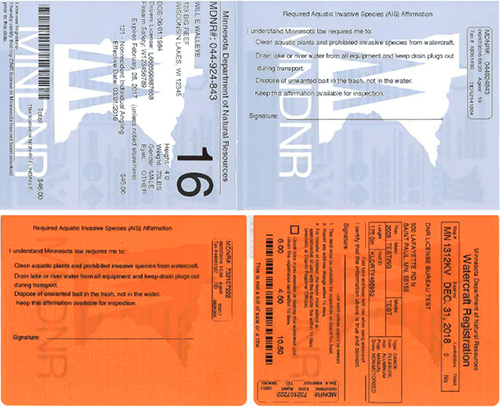 An affirmation card (shown above) reminds boaters and nonresident anglers of Minnesota’s aquatic invasive species laws. No one needs to renew their license earlier than usual, and there is no additional cost or training involved. The affirmation is a simple way of making sure more people using our lakes and rivers know how to follow the laws designed to protect our valuable natural resources. The affirmation, enacted by the Minnesota Legislature, is another positive step in the state’s proactive efforts to keep 95% of Minnesota lakes off the infested waters list. The state has also implemented mandatory training for anyone convicted of violating invasive species laws. Minnesotans are serious about preventing the spread of aquatic invasive species and the recreational, environmental and economic harm they cause. People convicted of violating Minnesota’s aquatic invasive species laws must complete a mandatory Clean In Clean Out class. The training ensures people who have been convicted of violating AIS laws understand those laws before they can legally operate their equipment again. The class is free and easy to take, either online or with a paper home-study. Anyone interested in protecting our waters from invasive species can take the free online class. The affirmation and mandatory class are two more tools to help ensure that people know and follow AIS laws. Less than five percent of Minnesota’s 11,842 lakes and 6,564 rivers/streams are on the infested waters list. The problem is serious, and slowing the spread of aquatic invasive species is everyone’s responsibility, but it’s far from a lost cause. Go to mndnr.gov/CICOtraining to learn more about the Clean In Clean Out class or to take the training yourself!